1. Host a story time at your local library. 2. Encourage children to read to each other. 3. Encourage parents to read to their children daily. 5. Support small publishers who are publishing books by native authors. 6. Make reading and writing fun. 7. Make free books accessible. 8. 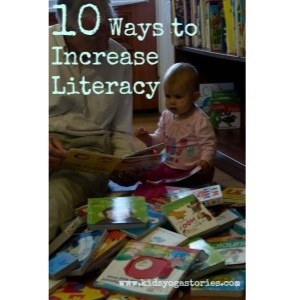 Get involved in local literacy programs. 9. Get involved in international organizations that promote literacy. 10. Sign up for online book clubs. Check out the Virtual Book Club with Toddler Approved and Educators’ Spin On It to organize reading groups all year round. Get the children excited about reading, sharing, and learning together with other children around the world. And, well, you know my suggested idea – have fun acting out books through kids yoga poses, going on imaginary adventures, and learning about various countries. What’s your idea to impact illiteracy? We would love to hear from you! Please email me at giselle at kidsyogastories dot com.